UltraBac Warp Workstation Edition provides point-in-time critical recovery for workstations and laptops. A form of Continuous Data Protection, this product uses Continuous Image Protection™ to protect all selected volumes rather than specified files and folders. This provides quick specific point-in-time (manually entered, selected from a graphical timeline showing backup activity, or from a bookmark) restores. Bare metal restores, even to dissimilar hardware, can be performed in case a more catastrophic event occurs. 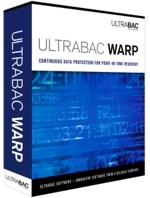 For a more comprehensive overview, UltraBac Warp for Windows Product Sheet. Learn more about system requirements for UltraBac Warp products. UltraBac Warp Workstation Edition is also sold in single use and 5-packs, as well as larger discounted quantities. For pricing of larger quantities, please visit the Volume Licensing section or contact us at 425.644.6000 or toll-free within the U.S. at 866.554.8562. UltraBac Software products are available for direct purchase, or they can be obtained through our authorized PartnerPlus channel. Our sales representatives are available to assist you in selecting the right software for your business backup and disaster recovery plan. Please feel free to contact us with any questions at 425.644.6000 or toll-free within the U.S. at 866.554.8562. Or email sales@ultrabac.com for assistance. For information on how to activate a license, please visit our license assistance section. Software version upgrades and software updates are available at no charge to all customers during the initial 30 day warranty period. After the initial warranty period expires, conditions do apply. For more information please review our upgrade policy. Maintenance Subscription Agreements (MSAs) are not available for single use, 3-packs, and 5-packs of the UltraBac Warp Workstation Edition. Maintenance can be purchased for quantities of 10 licenses or more at an additional cost. For more information please contact maintenance@ultrabac.com.